How to attempt AIIMS-MDS 2018? In this era of intense competition, aspirants face a large number of hurdles related to the preparations. Most of you must be putting a lot of hard work in grabbing a seat in your dream dental institution. AIIMS MDS is scheduled to be held on 18 November 2018. 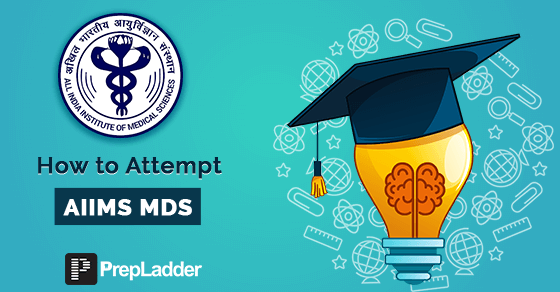 Through this blog, we have come up with an effective strategy to attempt AIIMS MDS 2018. According to our experts, if you follow the strategy mentioned in the blog, you will excel in the exam. Strategy to attempt AIIMS-MDS ?? It covers 40% of the portion and questions are generally asked from subjects like Oral Pathology, Oral Medicine, Oral Surgery, Orthopedics, Radiology. Few of the questions are sometimes asked from Dental Material, Prosthodontics, Anatomy etc. It covers remaining 60% of the portion. MCQs are generally asked from Dental subjects, Anatomy and Pharmacology. In the very first round, go for the direct questions which can be answered just by looking at them. These questions are based on our understanding of the subject. Many of the questions are just repeats. You can even go for direct image based questions in this round. Don’t attempt any new question in this round. Don’t attempt questions starting with Not, T/F types, Image based, value based questions. This round must be attempted spontaneously just like a rapper-fire. Once you are done with the first round, proceed to the second round. By this time you are a bit sorted out, now go for questions beginning with Not, T/F, questions with numerical figures. Reconsider the image based questions. This round must be attempted sensibly and with care. In the third round, you can go for the new questions. There might be 4-5 questions in the exam which you haven’t heard before. Go for elimination method for such type of questions. If you are able to eliminate 2 or more than 2 options, you can try such questions but if you don’t know anything about the question, just skip it. Wrong guesses lead to negative marking. So, do guesswork mindfully. Now the question comes, how many questions should be attempted?? The answer is as simple as it could be – just attempt adequate number of the questions in the exam. What is adequate number of questions? So, let us make it a bit simpler.. The number of questions to be attempted in the exam clearly depends upon the number of the questions attempted in the first round. If you could attempt > 45 questions in the first round, then you can go for 80-87 attempts. On the other hand, if you are able to attempt 40-45 questions, then you can go for 75-81 attempts. Try following the above mentioned strategy while attempting Mocks. You’ll be able find whether this works for you or not. If yes, practice as much as you can by following the same pattern so that you master the approach. It is very important to practice because unless you practice, you’ll lack the confidence and will not be able to give your 100%.